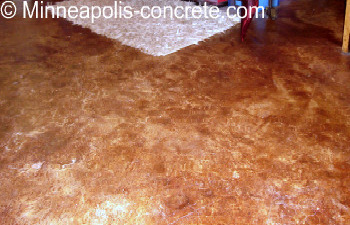 Stained concrete is achieved by applying color to the concrete after it has cured. This is a great option for updating your concrete, as it can be done years later. For example, many are choosing to update their basement flooring by removing the carpet and staining the concrete underneath. We have found that instead of carpet in a basement (which contains odors and produces a musty-wet/cold-feeling), that a decorative concrete basement floor with rugs actually "warms up" the basement. There are several ways to stain or color a floor. The traditional way is to use an acid-based stain. This type of stain reacts chemically with the concrete and creates a more “natural” look that mimics the natural color variations found in rock, stone, or wood. In staining, there are more “highs” and “lows” in the color. Since concrete has natural variations in the mix, the stain will combine with the concrete differently on various sections of your project. With stained concrete, it is hard to predict exactly what the color will actually look like since it combines differently on different areas of the concrete. For example, in the picture below, both the porch and the sidewalk connected to the porch were stained in Padre Brown. A potential downside to staining your concrete is that it only affects the surface. Therefore, if the concrete gets chipped or damaged, the underlying white/grey concrete will be exposed. 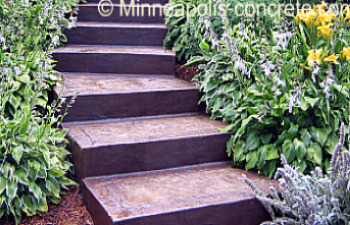 Therefore, stained concrete is most desirable in projects that won’t undergo heavy traffic. Generally, interior floors, patios and walkways are a better choice for stains than a driveway or other surface that will get driven over. You can also create interesting looks with acid-based stains by applying it randomly to individual stones in the stamp design. 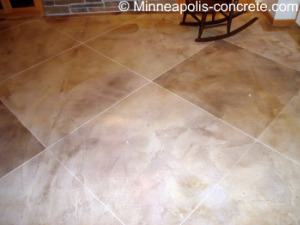 In this picture, a darker brown was added to random tiles that were saw cut into the concrete basement floor. Acid-based stains are great at masking blemishes that are already in the concrete, therefore, it is a great option for concrete refinishing. If you don't want to pay the expense of tearing out your concrete but want a new look, a stain may be a great option and much lower cost than pouring fresh! Click here to pick an acid stain color. 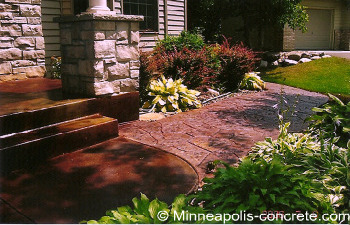 Would you like your existing concrete stained? If you live in the Minneapolis and surrounding suburbs area, request a quote.